I have asked several amateur cooks that I know to contribute some of their favorite recipes. This one is from Danny who is a “not quite a relative” and friend. Danny is a member of the gourmet club, and set the stage there with a beautiful and delicious German dessert. I hope we can all convince him to share that recipe with us in the future! Welcome Danny. Great discoveries are found every day. To take you back a few years it was New Years Eve and my girlfriend and I began a new tradition of staying in, curling up by the fire watching the ball drop. Early the next morning, we awoke for some breakfast which I am always happy to cook up. I made her the traditional omelette that she has grown to love, and this is a girl who typically ate one egg a year and that was an Easter egg! I took some leftovers of cooked shrimp, Boursin cheese and whipped up an omelette for myself. 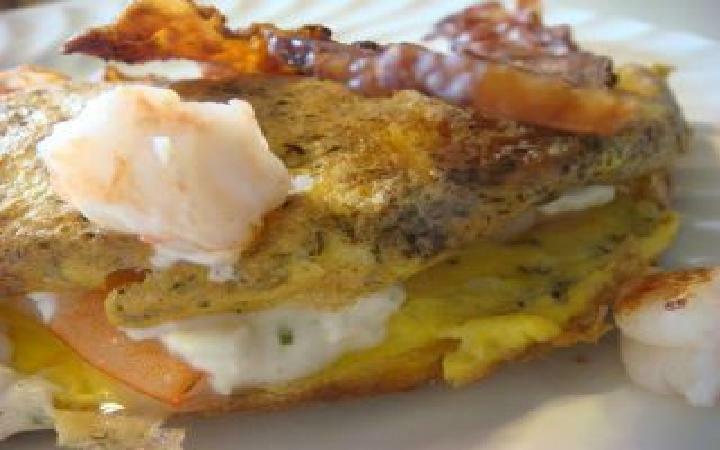 I love shrimp and Boursin cheese separately so why not combine them into a new creation. I sat down to try my new creation and the first bite was intoxicating. The second bite was shared with the one I love. When I saw her eyes light up I knew that we had a new creation and that I just lost half my omelette. I cannot think of a better way to start off a New Year, be courageous, inventive and never be afraid to meld uncommon ingredients in the kitchen. 1. Heat up your lightly greased omelette pan. 2. Beat eggs, adding a pinch of dill, salt and pepper to taste. Pour egg mixture into pan and cook until the omelette is ready to flip. 3. Flip to cook the other side for about 30 seconds. Turn again and add the cooked shrimp. Slice and crumble the Boursin cheese on and between the shrimp. Fold the omelette and let it cook for a minute or two. Bet it was out of this world! Thanks for sharing!